Traditionalists can point to a long precedent with a possible royal sanction. But secularists can counter with the uneasy murk of history: No one has ever been able to figure out just why audiences started standing up for the “Hallelujah’’ chorus. Theories abound, the most common being that King George II, attending the London premiere of “Messiah’’ in March of 1743, was so moved by the “Hallelujah’’ that he stood up - and if the king stands, everybody stands. The only problem is that there is no contemporary evidence he was even at the concert; newspapers and eyewitnesses conspicuously fail to report any royal presence. The first known mention of this breakthrough moment comes some 37 years later, in a letter by one James Beattie, relating the story secondhand: “The King (who happened to be present), started up, and remained standing . . . and hence it became the fashion.’’ There are accounts of George II attending concerts incognito, so he might have “happened to be present,’’ but if the audience was sufficiently aware of his presence to stand when he did, the lack of contemporaneous mention is an unusually airtight conspiracy of silence. 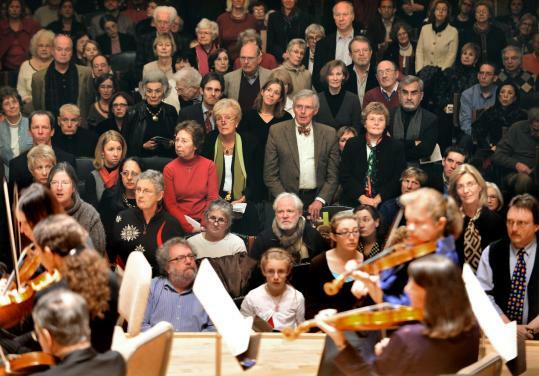 Audiences may have been spontaneously standing not because of royal example, but because of the confusing oddity of Handelian oratorio, and the additional oddity of “Messiah’’ itself. Handel’s hybrid of sacred subjects with operatic style, moving Bible stories into secular venues, had already struck some puritanical Britons as curious, or worse; “Messiah’’ went further, its libretto (by Charles Jennens) not even a dramatic narrative, but a theologically curated collection of Scripture passages. “An Oratorio either is an Act of Religion, or it is not,’’ complained one anonymous critic on the eve of the London premiere of “Messiah.’’ “If it is one I ask if the Playhouse is a fit Temple to perform it, or a Company of Players fit Ministers of God’s Word.’’ The sermon-like atmosphere of “Messiah’’ may have triggered audiences’ churchgoing reflexes, and they may have felt compelled to respond, standing for choruses as if they were hymns - better to be piously safe than sorry. Maybe this sort of sentiment was why, as the tradition settled in during the 19th century, standing for the “Hallelujah’’ was insisted to be a conscious homage to the divine. George II’s rise was attributed not to the power of the music, but as an acknowledgement of a ruler that superseded even him. The tradition made it intact to American shores, the Colonies naturally borrowing their cultural life from England. Benjamin Franklin is known to have attended a “Messiah’’ performance in Dublin in 1759, where he would have observed the custom. English professional musicians also would have brought such knowledge to America. Josiah Flagg (who had been the first to reprint Handel’s music in America) brought William Selby - formerly the organist at King’s Chapel, London - to Boston, lending authenticity to local Handelian efforts. Perhaps the custom persists precisely because no one is sure why it exists, leaving every audience member to choose his or her own rationale. Royal example, religious devotion, reassuring ritual, rousing musicality - take your pick. Or don’t: Remaining seated during the “Hallelujah’’ chorus ranks as one of the more effortless demonstrations of anti-authoritarian dissent. Victorian biographies, for their part, often included the story that Handel, when composing the “Hallelujah’’ chorus, said that he “saw heaven opened and the great God himself.’’ Whether that was enough to get him out of his chair is unrecorded.